Towards the end of the Silver Age, when the sales for Hawkman began to flag, and his own adventures were merged with those of the Atom, they began a friendship and partnership that was quite unique, teaming a little guy and a big guy together for seven issues that would feature their putting together mind and muscle when dealing with crimefighting. It was certainly a most clever tryout, mostly written by Gardner Fox and one of the last things he wrote for DC before leaving, and also Denny O’Neil. Yep, they could certainly use the kind of thing that he got from darling Jean whenever he helped to save her from criminals back then. Well, I don’t know about businesslike, but I do know that this kind of tongue-in-cheek scripting certainly conveyed a certain buddy-cop quality in their friendship as partners together, and that was what made even their final moments in a series at the time – work so well. Following 1969, they would split up, and return to solo stories, with Ray Palmer appearing in backup features occasionally published in Action Comics and Detective Comics (it’s amazing to point out that, when it comes to Superman’s flagship book of the time, those backup stories are what still remain in continuity! ), and Hawkman and Hawkwoman on occasion in backup stories published in the latter series. It was more recently, during the time of the fourth Hawkman’s solo series, that Ray Palmer guest starred in an issue where Carter Hall invited him to dinner in St. Roch at a resturant (and to get there, he could still travel by telephone lines! ), and also brought him along as “insurance” when taking on Hath-Set in Tibet. And he also had a brief role in the Headhunter story arc as well. Best thing about some of this of course, was the banter that went on between Hawkgirl and Atom, when he was sitting on her shoulder, always a good place for him in cases like these when working in partnership with superheroes like her. I do wonder if it’s possible to come up with a miniseries, if not an ongoing series, that could showcase both the Winged Warriors and the Mighty Mite together, and could enable them to work on some of those potential adventures that they never got the chance to work on together, and to really give the readers a chance to see how well they can work together as crimefighters, and even for Hawkgirl to exchange some dialogue with the Atom as well? I do hope it’s possible. But to really make it work, that’s exactly why, I should hope…the damage done to Jean Loring in Identity Crisis can and will be repaired, just like the error of doing in Sue Dibny. I really think that Jean and Ray should be reunited together as a couple too. What happened in the great Sword of the Atom in the mid-1980’s isn't that hard to reverse. One sure thing, without Jean’s wholesomeness as a character being restored, it simply won’t be possible to do it right. 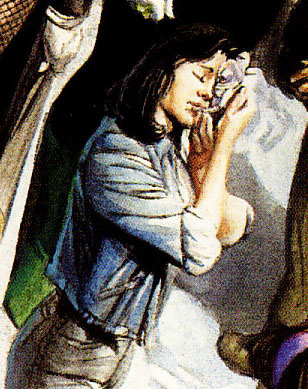 Jean could make a good supporting character in her own way for now, and could help out our heroes on the sidelines, if anything. So like I said before, it’d be a very good thing if DC would be responsible and make repairs to the characters. Copyright 2005 Avi Green. All rights reserved.